"The Clozer" is a portable or permanently installed device that was created to protect your plumbing from freezing. "The Clozer" is designed to pump non-toxic plumbing antifreeze into the domestic water system to prevent freezing and rupturing of these lines. "The Clozer" is completely portable and is ideal for camp owners, cottage, home, and boat, RV owners. It allows the user to virtually eliminate the need for costly annual visits from a plumbing professional to open up and close down vacation properties. Whether you completely shut down your home or cottage for the entire winter, or visit during the winter months at the cottage, "The Clozer" gives you convenience, flexibility and peace of mind that your investments are protected. "The Clozer" works simply by displacing water in your water pipes and drains while pumping non-toxic plumbing antifreeze in. Once the initial set-up is complete you are able to open/close your water system at any time. At the same time "The Clozer" also deals with solenoid valves in clothes washing/dishwashers, shower controls and ice/water makers in refrigerators - anywhere you draw water from. This procedure allows complete protection when you are not at your cottage, house, RV etc. and allows you to shut-off your buildings heat source, saving you money. 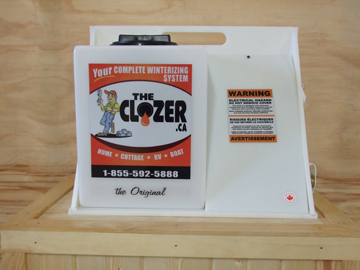 THE CLOZER is a portable device that was created to aid in your cottage and home winterization and protects your plumbing from freezing. It consists of a 15 litre reservoir for plumbing anti-freeze, a positive displacement self-priming pump, a recessed hose connection to connect to your plumbing system and a recessed 120V male plug end to connect the electrical supply. All of this is mounted on a white High Density Polyethylene Plastic stand for strength and durability. How does "THE CLOZER" work? "THE CLOZER" simply pumps non-toxic plumbing anti-freeze into your domestic water pipes, drains and appliances, to prevent them from freezing during the winter months. This procedure allows complete protection when you are not at your cottage, house, RV, etc., and allows you to shut-off your building heat source saving you money with no need for worry about frozen pipes. Why not just drain or blowout your water pipes? As with some home or cottage ideas, draining or blowing-out water pipes is not a fail-safe method of preventing frozen pipes. Draining or Blowing-out can leave water trapped in the water pipes often resulting in ruptured or frozen water pipes, never mind frozen appliances. "THE CLOZER" displaces the water in the pipes, drains and appliances, preventing them from freezing. Does "THE CLOZER" just protect your water and Drain pipes? dishwasher, clothes washer, ice maker and any other domestic equipment that has water connected to it for complete cottage and home winterization. Why is "THE CLOZER" a good investment? We all know what water damage can do! Reduce or end vacation time due to repairs. Cause damage to floors, walls and ceilings. Damage appliances and equipment making them inoperable. Cause mould if not addressed immediately. valuable "THE CLOZER" could have been. How do I install "THE CLOZER"? Within the instruction and installation manual you will see step by step installation instructions. We have created an installation kit that is also available and covers most piping configurations. Although we have made installation user friendly, we still recommend that you seek the service of our installation team or a qualified plumber, and follow all local building codes. How can we help you with your installation or with any questions or concerns that you have? We have established a toll free number 1-855-592-5888 for you to contact during business hours. We can also be contacted by email info@theclozer.ca. What kind of Plumbing Antifreeze can I safely use in "The Clozer" to protect my water pipes? Ethanol - The fermentation of sugar into ethanol is the main ingredient of alcoholic beverages. Propylene glycol - Propylene glycol is a chemical made by reaction of propylene oxide with water. It is used in a wide variety of consumer products, including foodstuffs, animal feed, cosmetics and pharmaceuticals, as well as industrial applications. Premium Non-Toxic Antifreeze - has less than 1% expansion at -50C which is better for copper piping. There are no extra additives to the Premium Non-Toxic Plumbing Antifreeze to make it metal/copper pipe friendly. Always remember to flush your water pipes and drains thoroughly after using Non-Toxic Plumbing Antifreeze. We do not recommend the use of Windshield Washer fluid to winterize your plumbing as it contains Methanol - Methanol is the simplest alcohol, and is a light, volatile, colorless, flammable liquid and is used as an antifreeze, solvent and fuel. Durable Construction won't break or rust (under normal conditions). Portable - overall 18-lb. device with convenient carrying handle. Check out Clozer II - same great product - with even more savings to be had. With the addition of TC-3, The Clozer Original or Clozer II can winterized your line to the lake/well.